A specially formulated cover crop inoculant plus the benefits of the iGET™ Technology. 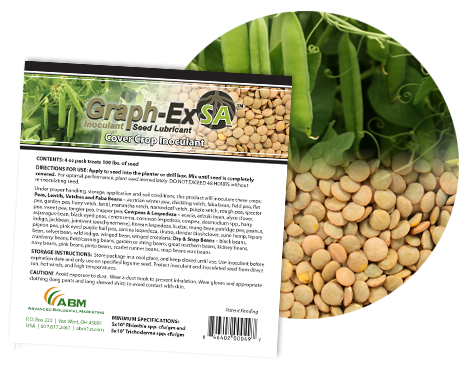 Graph-Ex SA™ for Cover Crops is a planter box treatment that can be added right at the planter just before planting and is your answer to increasing nitrogen levels in the soil with a legume crop, including peas, lentils, vetches and faba beans. Graph-Ex SA™ for Cover Crops is your answer to increasing nitrogen levels in the soil with a legume crop, including peas, lentils, vetches and faba beans. Graph-Ex SA™ has you covered when it comes to nitrogen management. Treats all grasses grown for grain and forage. Cover crops have become a necessary step in the recycling and production of nitrogen and organic soil matter. The use of biologicals in accomplishing nitrogen fixation and production has become commonplace. Now, with the introduction of Graph-Ex SA™ for Cover Crops, farmers can expect more out of both their soil and crops. The SA means that ABM™ has also added our proprietary, patent pending Trichoderma strain found in SabrEx™ root inoculant. Trichoderma has been shown to be beneficial in cover crops. Our proprietary Rhizobia for legume cover crops is specifically beneficial for these crops and helps the plant to establish nitrogen-fixing nodules that will convert the nitrogen to a useable form for the plant. The Rhizobia in Graph-Ex SA™ for Cover Crops is a different type of Rhizobia than is used for soybeans. The nitrogen fixing Rhizobia found in Graph-Ex SA™ for Cover Crops will aid in the production of nitrogen by establishing itself inside the root nodules of the host plant. Working symbiotically within the plant’s nodules, inoculation will maximize the desired nitrogen credits. As an added benefit, utilizing a talc/graphite formulation as the carrier helps to lubricate your planter equipment and improves seed flowability. This is important, as it will minimize seed hang-ups in your equipment and reduce wear and tear. Graph-Ex SA™ for Cover Crops is a planter box treatment that can be added right at the planter just before planting. You will add one 4 oz. packet for every 100 lbs. of seed added to your drill. Make sure to thoroughly mix Graph-Ex SA™ for Cover Crops in your seed. Refer to the Graph-Ex SA™ for Cover Crops label for specific rates and directions for use. Once you have applied Graph-Ex SA™ for Cover Crops to your seed it is best to plant it immediately. Occasionally, delays can be expected in farming, however, after 48 hours you will need to retreat your seed.